Discussion in 'JS Plugin Requests' started by Twitch, Jun 15, 2018. 1) Change an Actor's spot in the formation. Front Row would increase offensive stats, Back Row is defensive stats. 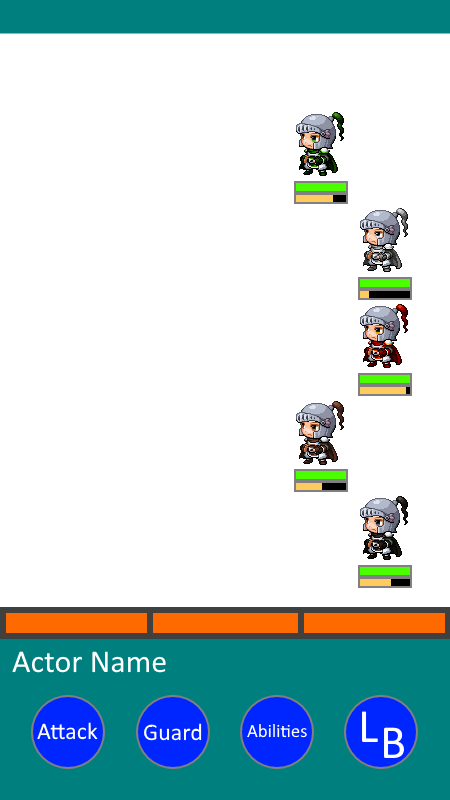 I know how to use Yanfly's Row Formation plugin, but I am unsure how to keep the Actors in a line, as seen above. Yanfly's plugin makes the Actors bunch up, and I wish to keep them in their slots (1 through 5). 2) Show only the active Actor's status and abilities. Due to the limited screen size, only the Actor whose ATB has filled (and is active) would have their options shown. 3) Use pictures/graphics to select Attack, Guard, Abilities, and Limit Burst. Attack and Guard would do exactly that, but pressing Abilities and Limit Burst would change the original 4 buttons to 4 new ones. Those would then be the equipped Abilities and Limit Bursts, respectively. There are plugins that utilize being able to use graphics to call events, so this would tie in to 2) where only the active Actor's options would be visible. 4) HP and ATB Bars below Actors. I believe that Yanfly has a plugin where the HP bars can appear below Actors, but I have not seen a Yanfly-compatible ATB plugin that can do the same. If anyone would please be able to either direct me to the applicable resources, or have some ideas on how to accomplish this, it would be most appreciated. Thank you in advance! Plugin Support is for when you need help with an existing plugin. I've moved this thread to Plugin Requests. Please be sure to post your threads in the correct forum next time. Thank you. I originally posted it there because I was seeing if there were existing plugins that could accomplish what I am hoping to do. But I can see why it was moved. @Twitch Even if you're looking for existing plugins, it would go in this place. As I said, Plugin support is only when you're already using an existing plugin (for example one of Yanfly's) and need help getting it to work. Ah, I understand! Thank you for clearing that up. Sorry to enter this, but how do you make the Actor's order in Row Formation Plugin change? I kinda like having similar to FF series. You already have a thread where you are asking this. Please keep queries about this to one place only.